*(Via Reuters) – Belgian public broadcaster VRT raised the death toll from Tuesday’s twin attacks in Brussels to 34, with 20 people killed in the blast on a metro train and 14 in explosions at the airport. A witness said he heard shouts in Arabic shortly before two blasts struck a packed airport departure lounge at Brussels airport. The federal prosecutor said one of the blasts was probably triggered by a suicide bomber. 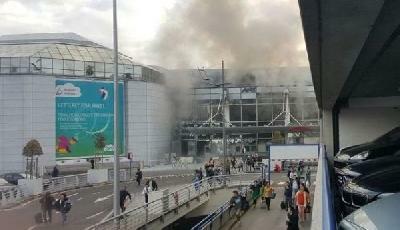 The Belgian health minister said 11 people were killed in the airport bombing and 81 wounded. The blasts at the airport and metro station occurred four days after the arrest in Brussels of a suspected participant in November militant attacks in Paris that killed 130 people. Belgian police and combat troops on the streets had been on alert for any reprisal action but the attacks took place in crowded public areas where people and bags are not searched. Many of the dead and wounded were badly injured in the legs, one airport told Reuters, suggesting at least one bomb in a bag. Read/learn MORE of this Reuters report at MSN News.